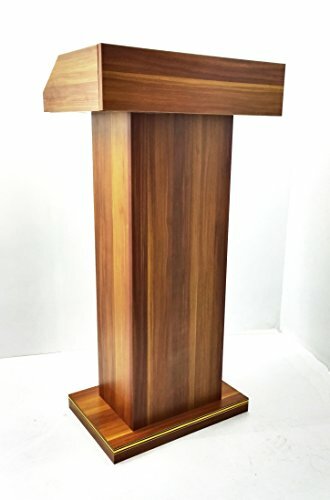 Deluxe wood podium is ideal for restaurants, hotels and churches. Features large 22"x15.4" top and 5.5" tall walls for great comfort and privacy. Ships flat for best economy. Easy to follow assembly instructions provided. Step by step assembly video provided. Base is 20"x13.3". Top is 22" wide by 15.4" deep. Height is 43.4" to the very top. 38" from floor to the table top.